Looking for a Used EX37 in your area? CarGurus has 25 nationwide EX37 listings starting at $11,390. 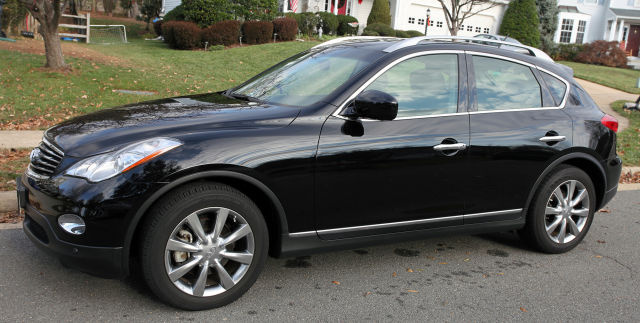 New for 2013, the Infiniti EX37 luxury crossover vehicle replaces the EX35, which has appeared in the automaker's lineup since 2008. The EX37 comes in well-equipped Base and upper-level Journey trims for 2013, with standard rear-wheel drive (RWD) and optional all-wheel drive (AWD) at both trim levels. Stylish and sporty, the EX37 mixes the practicality of a cargo-friendly hatchback body style with the aggressive sportiness of a finely tuned sport coupe. Infiniti also equips the EX37 with cutting-edge tech features, a refined interior and an eye-catching exterior design. However, it does have its drawbacks, which include a tight cabin, mediocre cargo capacity and limited visibility out the back. The change in nomenclature from EX35 to EX37 reflects the vehicle's new 3.7-liter V6 engine, which provides more power and torque than the previous version's 3.5-liter V6, with no penalty in fuel economy. The new V6 produces 325 hp, an increase of 28 hp over the previous year, while torque increases to 267 lb-ft, up from 262. The engine links to a 7-speed automatic transmission with a manual shift mode and a DS mode with Downshift Rev Matching (DRM), which helps provide smoother downshifts. Despite the increase in horsepower and torque, fuel economy numbers remain the same as the previous year's, at 17/25 mpg for RWD trims and 17/24 for AWD trims. The EX37's Intelligent All Wheel Drive system senses road conditions and automatically sends up to 50 percent of available power to the front wheels when needed to ensure optimal traction. The EX37 rides on an FM (Front Midship) platform, which it shares with the sport-oriented Infiniti G37 sedan and coupe, and testers say the EX37 rides and handles much like the G37. The platform features an independent front double-wishbone suspension with aluminum-alloy upper and lower links, and a rear suspension with an independent multi-link configuration, as well as high-performance shock absorbers and stabilizer bars in both the front and rear. Speed-sensitive power-assisted steering provides a precise feel, while the standard antilock brakes do a good job of stopping the vehicle. Combined with the sporty suspension and the 7-speed automatic transmission, the EX37's new V6 provides a spirited ride, with quick, smooth acceleration and agile handling. The suspension easily absorbs most road imperfections and keeps the EX37 from exhibiting too much body lean in tight corners, even when taken at speed. Working together, the new engine, transmission and suspension provide one of the best rides of any SUV or crossover vehicle, according to reviewers, and make it stand out in a crowded automotive class. Outside, the EX37 displays a sculpted exterior design, highlighted by a coupe-like front end and a long hood, rounded nose, distinctive Infiniti grille, lower mesh air intake and oval foglights. The low stance and pushed-back cabin reinforce the EX37's aggresssive appearance, while swooping sidelines, an arcing roofline and minimal overhangs add to the vehicle's visual distinctiveness. Other Infiniti touches include the L-shaped headlights, heated exterior mirrors, distinctive LED taillights and chrome-finished dual exhaust pipes. In addition, owners can add such exterior features as xenon auto-leveling headlights and roof rails. All trims ride on 18-inch aluminum-alloy wheels, although owners can add 19-inch wheels on the Journey trims. Inside, the EX37 delivers an equally impressive cabin, as expected from any vehicle bearing the Infiniti badge. Such upscale features as leather upholstery, a leather-wrapped steering wheel, dual-zone automatic temperature control and push-button ignition come standard on all trims, while the EX37 Base AWD and Journey trims add heated front seats, and the Journey trims also include maple accents and a power tilt/slide moonroof. High-quality interior materials and soft-touch surfaces provide a plush, comfortable feel, and overall build quality is very good. The sporty instrument cluster features high-contrast gauges, making them easy to read, and the unique double-wave dashboard creates two distinctive seating areas for the driver and passenger. On the downside, the EX37's 5-passenger cabin feels tight, reviewers say. Although most passengers will find enough legroom and headroom in the front, the second-row seat is too cramped for 3 adult passengers, with limited headroom and legroom. Taller passengers in particular will feel uncomfortable in the back and might find limited headroom in the front. Rearward visibility also remains problem, with the EX37's sloping roofline and thick C-pillars hampering visibility. All EX37 trims come equipped with an 8-way power-adjustable driver's seat with lumbar support, a 4-way power-adjustable front passenger seat and a tilt/telescopic steering wheel, as well as a 60/40-split rear seatback. Cruise control, remote keyless entry, rear heating and cooling vents, an illuminated entry system and a 6-speaker audio system with SiriusXM satellite radio, a USB port and illuminated steering-wheel-mounted audio controls are among the other standard features across the line. All trims also receive a 7-inch color vehicle information display. The Journey adds such features as a power tilt/telescopic steering wheel, an auto-dimming rear-view mirror and Bluetooth, as well as such options as a navigation system, advanced climate control, power folding second-row seats, intelligent cruise control and a Bose 11-speaker audio system. In addition, owners can add the automaker's Around View monitor and sonar system, which gives the driver a view of all sides of the vehicle. Cargo space for the EX37 checks in at 18.6 cubic feet with the rear seats up and 47.4 cubic feet with the rear seats folded down. Those numbers come up short when compared to such competitors as the Volvo XC60, which offers up to 67.4 cubic feet of storage space, and the Acura RDX, with up to 61.3 cubic feet of cargo space. The EX37's wide rear hatch and low load floor make it easy to stow cargo. The EX37 comes well-equipped with all the standard safety features, including electronic brakeforce distribution, traction control and brake assist, as well as a full range of airbags. Also included is an online guide called SnugKids, which helps owners select and correctly install a child restraint in their Infiniti vehicles. Safety options include a blind-spot warning system, intelligent brake assist and a lane-departure warning system. Owners like the EX37's combination of sporty performance and handling, along with its functionality and good looks. While they agree it doesn't offer as much cargo space as some competitors, the EX37's well-designed and comfortable cabin, along with its numerous luxury-oriented and tech-oriented features, make it a good fit for those seeking an upscale sport hatchback. 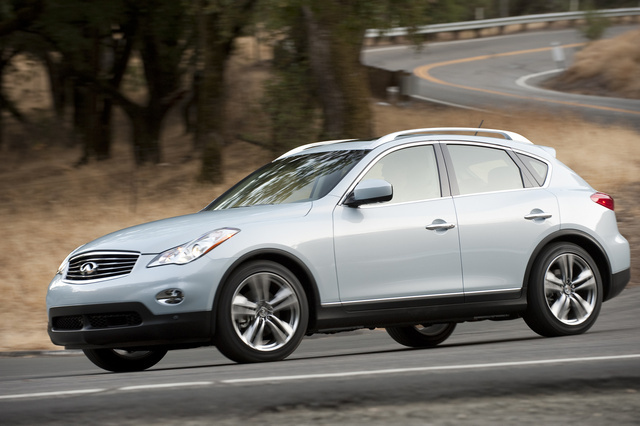 What's your take on the 2013 INFINITI EX37? Sbrates I have had my EX 37 for 6 months and love everything about it except the 7 speed transmission seems to miss finding its gears when I accelerate and it revs up to 5000 before catching and the gear. Its great from gear 1 to 3 (0 to 80) but thereafter (and not always) its not as responsive. Anyone else find that? 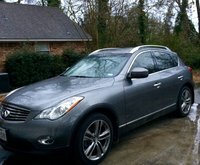 Have you driven a 2013 INFINITI EX37?